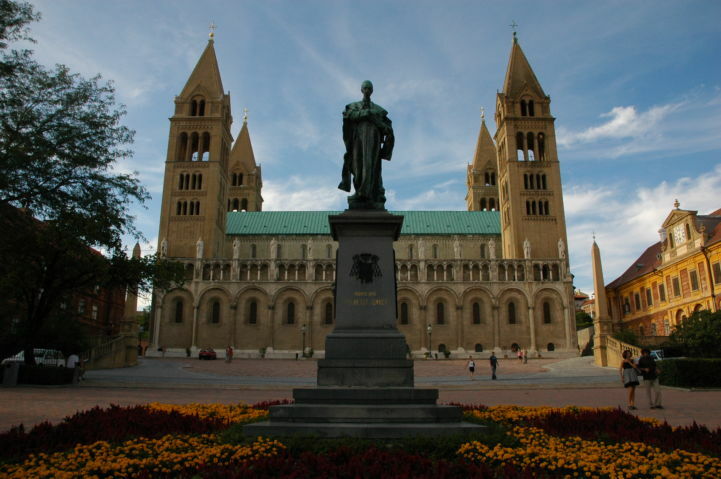 The construction of the Cathedral began in the 11th century, after the previous church burned down in 1064. The a building shows the architectural characteristics of many centuries as every bishop reconstructed the building in the style of his own age. Most significantly, the Cathedral shows Classicist and Gothic characteristics. Its present form was completed by the 19th century. The facade is decorated with statues of Apostles. They were sculpted by Károly Antal in 1963. The richly decorated interior of the three-nave Basilica is divided in two by a triumphal arch. The impressive altar is the work of György Zala. The church organ was made in the Angster Organ Factory of Pécs in 1887. This spectacular instrument has 6101 pipes with lengths ranging from 5 millimeters to 5 meters. This is the first cathedral in Hungary which have been fitted with an air ventilation system in order the preserve the condition of the building. During his visit, Pope John Paul II gave the rank of Basilica Minor to the Cathedral. 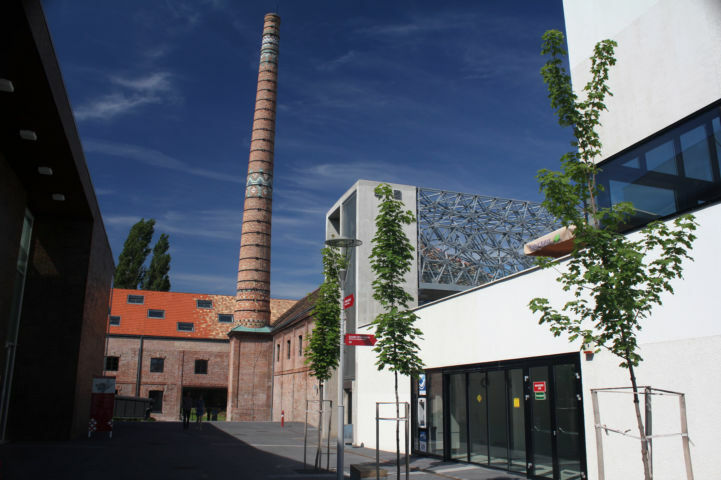 The complex was opened in the 5 hectares area of the Zsolnay Porcelain Factory in 2012. The exhibition space is divided in four parts. In the Craftsman's Quarter, we can see an exhibition on the history of the Zsolnay family , the Pink Zsolnay exhibition of Barnabás Winkler and the Gyugyi Collection of ceramics. Also, here is the renovated Zsolnay Mausoleum, the Creative and Incubator House, and the shops of the Handcrafts Street. The Creative Quartes gives place to cultural institutions and restaurant, and its also the venue of festivals. The most important sights of the Family and Children's Quarter are the Planetarium, the new building of the Gallery of Pécs and the Bóbita Puppet Theater. Faculties of the University of Pécs are located in the University Quarter. During the 143 years of the Ottoman Occupation, the cityscape of Pécs became quite oriental. The conquerors built mosques for worship, baths and the main street was turned into a bazaar. The mosque was built by using the stones of the St. Bartholomew's Church that stood on the square, commissioned by Pasha Qasim who occupied Pécs in 1543. Based on its size, it is the most significant Ottoman monument in Hungary. In his travelogue, Evliya Çelebi, who traveled the Ottoman Empire, wrote that beauty and size of the building in Pécs is comparable to the mosque of Sultan Selim in Istanbul. The thanksgiving prayer for the liberation of Pécs in 14 October 1686 was held here. At the beginning of the 2nd century, the Romans founded the city of Sopianae in the present day area of Pécs. This archaeological exhibition space displays the tombs of the Early Christians from the 4th century. During the excavations of the past 200 years, many chapels, tombs, mausoleums and thousands of late Roman objects were found. The buildings and murals shows the architecture and art of the Early Christians in the northern and western provinces of the Roman Empire. In 2000, the Early Christian tombs of Pécs became part of the UNESCO World Heritage List. The exhibition showing the works of Tivadar Kosztka Csontváry opened in a turn-of-the-century Neo-Renaissance building in the city center of Pécs in 1973. During his life, Csontváry was not widely known and appreciated as a painter. After his death, his paintings were almost sold to be used for as canvas for carriages, and the paintings were only saved thanks to architect Gedeon Gerlóczy who discovered the quality of art in Csontváry's work and bought the pictures. In the first month after the opening of the museum, 20 000 people visited the exhibition. The Lonely Cedar, one of the most famous paintings of Csontváry is also displayed here. Victor Vasarely was born in Pécs in 1906. At the age of 24, he moved to France where he lived until his death in 1997. The artist gave 42 of his prints to a museum in Pécs in 1969. In response to the welcoming reception, Vasarely sent a collection of works which spans his entire life. This served as the basis for the museum which opened in 1976. Today, the Vasarely Museum is one of the most popular exhibition in the city. The exhibition displays works all periods of Vasarely's life, starting from the early Bauhaus-inspired, analitic-geometrical drawings to the op-art in dialogue with architecture. The widely known Zebra paintings are also displayed. There is a room dedicated to the works of Vasarely's wife, Klára Spinner, inspired by the Bauhaus in the 1930's and 1940's, and also for the work of his son, Jean Pierre Vasarely (Yvaral) which continues the legacy of his father. The modern building of the lapidarium was designed by Kossuth Award winner architect Zoltán Bachman. Many important stoneworks from the Age of Árpáds and the pieces of the Dome from the Middle Ages can can be seen here. The monument building, found at the western side of the Cathedral, was built in the 12th century and rebuilt in the 19th century. During the renovations, almost all traces of its Middle Ages origin disappeared. Only the general scheme, the southeastern Gothic window fragment, the material of the walls and a gate preserve the original building. One of the balconies give place to a Franz Liszt statue overlooking the Cathedral. According to a local legend, the famous composer was inspired by the ringing of the church bells. The complex of monument buildings around the Episcopal Palace includes the Barbican. A barbican is a fortified outpost which regularly had its own moat, drawbridge and back door. The circle shaped tower from the 15th century was part of the wall system of the Bishop's Castle. Probably Pál Kinizsi was responsible for the construction of the Barbican. The top of the bastion offers a fantastic view on the city center. The Barbican was built in order to defend from a full frontal attack of the gate and disperse the army of the Zsolnay Cultural Complex. The Roman city of Sopianae was founded at the beginning of the 2nd century and it was an important junction before. From the end of the 3rd century Christianity was spreading rapidly, in the 4th century tombs and chapels were built for the richer citizens. A cemetery of the antiquity was near Szent István Square where many tombs were found, some of them can be visited. The Jug Tomb was found in the 18th century but the archaeological excavation only took place in 1939. The tomb is decorated by wall paintings amongst them the depiction of a drinking jug from where the tomb got its name. The remains of a chapel have also been found. Today the tomb is protected by a building built around it. The early Christian Mausoleum was excavated in 1975-76. The structure has two floors. The first floor is the mausoleum which contains two tombs and an antechamber. Most of the walls are covered with paintings; the eastern room’s wall shows a scene of the fall of man: the apple tree with the serpent around its trunk, Adam on the left and Eve on the right. The coins found here prove that the tombs were buried here in the 4th century. There is a chapel above the mausoleum. The Roman and early Christian tombs of the city are part of the World Heritage. In 1922, a three-apse burial chapel was found near the Cathedral. Its floor still had some of the original mosaic and the walls preserved two layers of paint. The earlier is dated from the 4th century, the second layer is from the 9th century. In 1938 another, a seven-apse burial chamber was unearthed but it was reburied by the archaeologists. During a construction in 2002, more Roman tombs and other findings were discovered. In 1009, St. Stephan founded the episcopate in Pécs, in the 11th century there was a cathedral here but it was destroyed in a fire. In the 12th century a new cathedral was built with three naves. It was expanded and redecorated in the 14th and 16th centuries. During the Ottoman times it was used as a school and storage. The murals and the Árpád Age reliefs were damaged. Although it was restored in the 18th century, the walls of cathedral became dangerously unstable by the 19th century. The walls and towers were rebuilt, the building as it is today was completed between 1882 and 1891. The murals of Saint Maurus and Mary Chapels were done by Bertalan Székely and in Corpus Christi Chapel by Károly Lotz.